NF has undertaken considerable grassroot level work towards water conservation and management in both rural and urban scenario. Mass awareness is being spread by the organization on water conservation and management with the active involvement of the farmers, schools, colleges, universities, government and civil society organizations and the community. Rural community is being made aware to save the natural water resources. The organization time to time carries out research and studies on the existence of the historical water bodies. At the same time, the water bodies which have been encroached are saved through raising awareness amongst the local community. They are educated on the importance of these water bodies and are taken on exposure visits to other parts of the country where water conservation is being successfully done through these structures. India’s first ever rural rain centre has been opened at Poothi village, district Meerut. The rain centre also has a rainwater harvesting structure which can store upto 1,25,000 liters of rain water. More than seven water bodies have been revived through community participation. 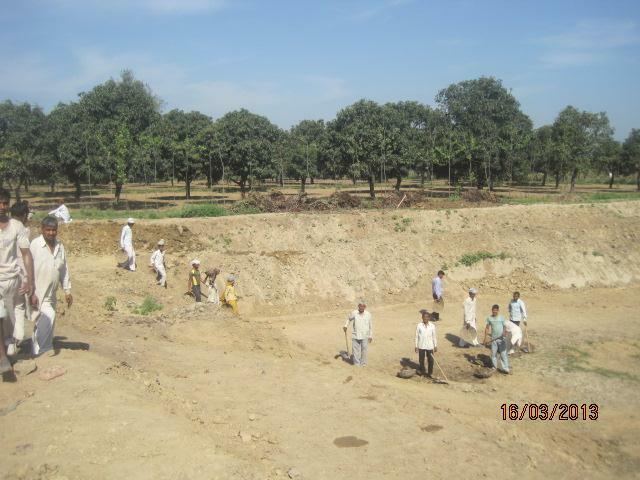 The revived ponds have been handed over to the group of local villagers through natural water resources committees headed by Gram Pradhan for maintenance. NF has been working towards facilitating individuals and organizations in setting up the rain water harvesting structures. We have already motivated and facilitated in establishing rain water harvesting structures in more than 68 buildings all around the district. The main objective is to enable people to have access to potable water while at the same time restoring aquifers and reducing the pollutant levels within them. NF time to time creates awareness on water and sanitation hygiene amongst the urban and rural communities of the district. Information about personal hygiene, good habits, hygienic practices during menstruation, water hygiene, proper sanitation and other issues is given to the women/girls and children. NEER Foundation is running ‘My Clean Meerut’ campaign which aims to reach the people the Meerut City and inspire them to show their love and pride for the environment. This is an association with ‘My Clean India’, a campaign which was embarked on by Mr. Remco Van Santen from Australia. The campaign encourages people to take personal responsibility and by that, together find ways to keep their environment clean and green. This campaign is not just about less litter and rubbish although that is very important but also for cleaner air, cleaner water, cleaner soil, and even a cleaner mind and relationships. NF ensured provision of safe drinking water to the community by sensitizing them about water quality and its safeguard as well as treatment. It conducts research studies and implements solution based programs in the region facing gross violation of human right to water. NF strives to bring back rivers of Western Uttar Pradesh, back to their lives which were earlier the lifelines of the region. This is being achieved through awareness creation among the community living on the banks, implementing pollution control measures and advocating with the government bodies responsible for the safeguard. The organization has also taken the lead to prepare the first policy draft of river polity for Uttar Pradesh, for the government to formulate a policy based on the points. It has made potential contribution for saving the highly polluted Kali River (E), Ganga River, Kali River (W), Hindon, Krishni & Budhi Ganga. A mass campaign has been launched wherein ‘Raksha Samitis’ and ‘Nadi Rakshaks’ have been appointed in the villages located on the banks of the rivers. A documentary has been produced on the extent and causes of the pollution of the pollution and the foundation is in the process of documenting the historical importance, present situation & future of these rivers in the form of a book which would be published soon. NEER has undertaken several water teats, studies and surveys to collect information on river water, its pollutants and ill effects of the river water on residents, lands and crops. A documentary has also been composed to showcase the condition and plight of river East Kali. Recently Mr. Raman of NEER Foundation has been made as the East Kali Waterkeeper by Waterkeeper Alliance, New York, to undertake safeguarding of the river. Save Ganga Campaign was initiated few years ago with the help of organizations, social activists and authorities. Ganga is our holy river which is getting polluted drastically and it is all citizens’ responsibility to reclaim the holy river before it goes extinct at our hands. Numerous awareness drives are undertaken in the program time to time. The Rivers of the west are crying for help as their tributaries have gone extinct or are carrying large quantity of dump which is being added to these rivers every day. Several tests have confirmed the hazardous content of the river waters of these rivers. NEER is putting out efforts to aware the authorities and community, to revive the rivers and put a ban to dumping of wastage by numerous factories and sewage pipes.